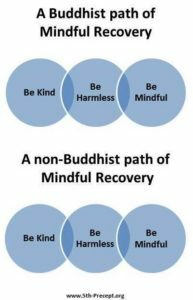 The Fifth Precept Sangha (Fellowship) exists to promote a wholly Buddhist approach to recovery from alcohol and other drug addictions. It’s core principle is the avoidance of suffering through the positive practice of abstinence from all intoxicants. The Fifth Precept Sangha embraces the 2,600 year old principles and practices of Sajja (Truth and Truthfulness), Dana (Generosity), Sila (Ethical living) and Sati (Mindfulness) as a wholehearted path of awakening; and promotes this through meditation group(s) and recovery retreats. The ancient practices of Metta (Loving-kindness) and Khama (Forgiveness) are actively encouraged both for the well-being they provide and to close the door to relapse as a result of low self-esteem and guilt; and other negative self-beliefs. 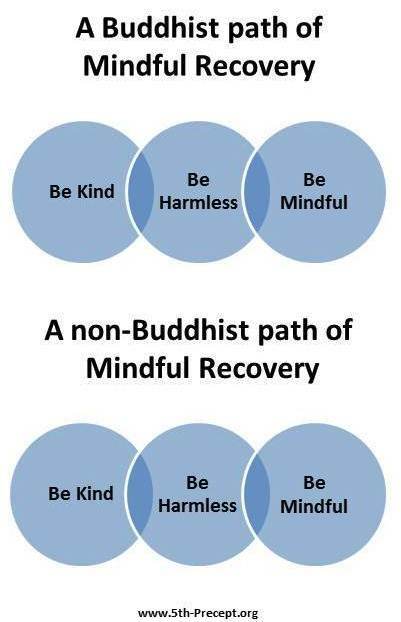 The Fifth Precept Sangha believes that addicts can attain a relaxed, comfortable and long-lasting recovery through this path; and that importantly, you do not have to be a Buddhist or become a Buddhist in order to adopt or adapt, any of these practices and principles specifically for your own recovery. Recovering people of all faiths or none are welcome. 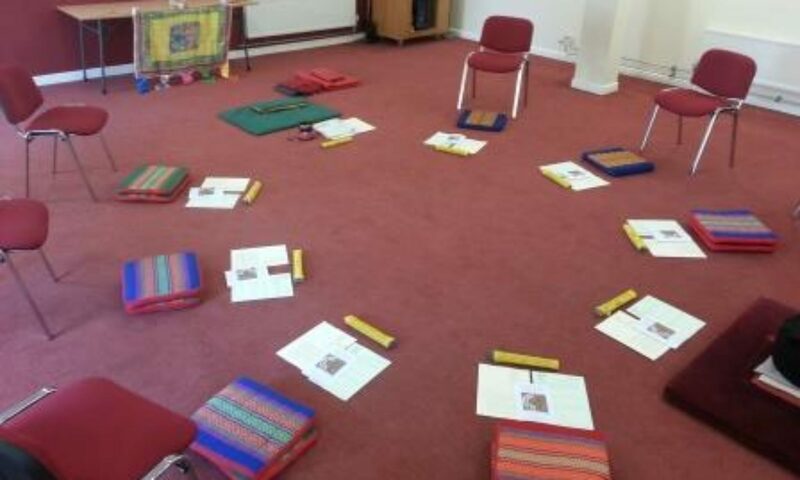 Fifth Precept Organisation (Sangha) : is a Buddhist oriented approach to total-abstinence including peer led ‘Sit-and-Share’ meditation meetings. Hungry Ghost Retreats : are an opportunity to explore some of the principles and practices of the Fifth Precept Organisation (Sangha) approach to recovery, harm reduction and relapse prevention within a retreat setting.